Remember when the iPod first came out, people compared it to a little transistor radio. How the iPod only held a thousand of your songs while the pocket radio held what seemed like an endless amount. Of course, the radio gave you what the radio show owner wanted you to listen to while the iPod was completely in your control. And, what seemed like an endless number of music titles on the radio was actually limited to what the producer thought would keep you coming back. 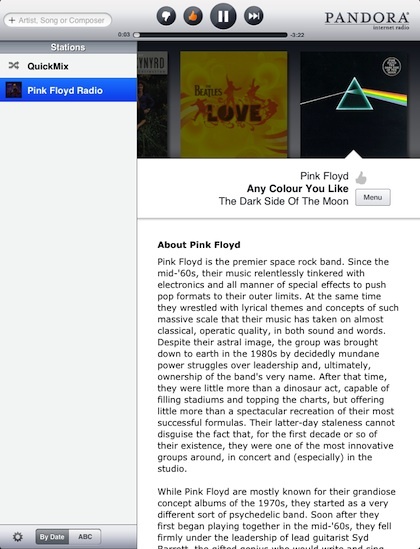 For the iPad, the ‘modern’ radio is the Pandora app. This free (account set up required) universal app lets you decide the type of music you want to have streamed to you. 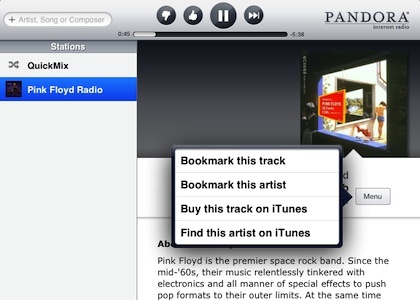 After choosing a type of music or a band, Pandora starts streaming a song to you. 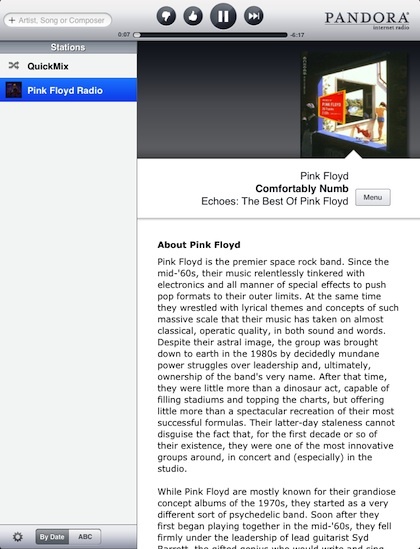 With the song is quite a bit of text giving you fun facts about the band, song or album. 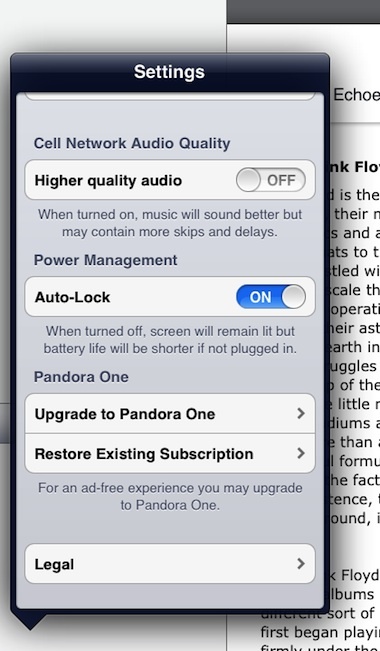 There is a ‘Settings’ area to the Pandora app. This is important for tuning the steaming to match what your Internet access method is. If you have a strong connection then choose to have ‘High quality audio’… think of it like turning your little radio to get the best/strongest signal. When everything is perfect, the music is full, strong and doesn’t skip… have a slow connection and the music stream may ‘skip’ a bit. There is an occasional break in your music where Pandora plays a commercial… what do you expect from a free music service?! They are short and not very often. You can opt for a $3.99 subscription service version that auto charges every month for ‘less’ commercials. The reason you have to set up an account with Pandora is so that the system will learn what you like and dislike. Use the thumb up/down buttons to tell the system if you are enjoying the song. After a while, the music steaming to you will be tuned especially for your enjoyment instead of just what the radio station feels you should like. Each album cover for the song being streamed to you appears from the right and the last couple dim off to the left. Notice the Pandora controls along the top lets you say you like or dislike the song, pause the song or jump to the next song. Careful with the jump-to-next button as there is no going back a song. You can add more songs/composer searches and expand the left selections. Treat the searches and list on the left like you would a dial on a radio… one for a holiday music stream, another for work outs and another for when you need to concentrate on a project.